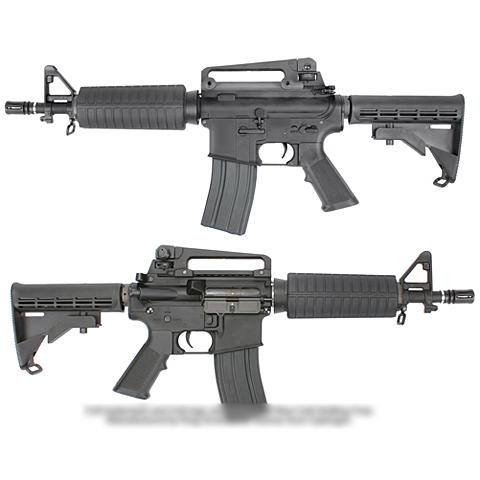 The Colt M4A1 Ultra Grade rifle is equipped with Nylon Fiber receiver to reduce the rifle weight. The gearbox is made from high quality internal parts to ensure the shooting power and durability. This rifle is an official licensed product with full trademarks and logo. Package comes with a 300 rounds magazine. 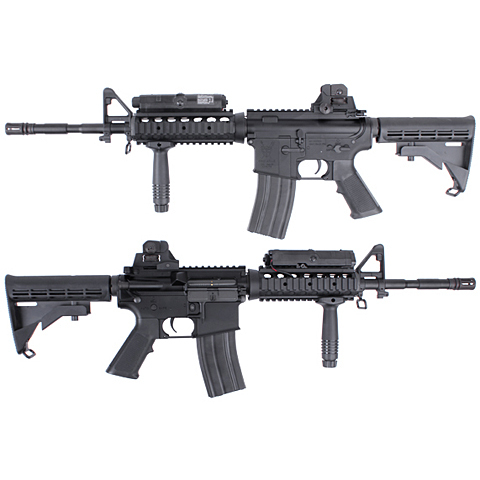 The Colt M4 RIS Ultra Grade rifle is equipped with Nylon Fiber receiver to reduce the rifle weight and high grade Aluminum tactical rail to install accessories. The gearbox is made from high quality internal parts to ensure the shooting power and durability. This rifle is an official licensed product with full trademarks and logo. Package comes with a battery case and 300 rounds magazine. 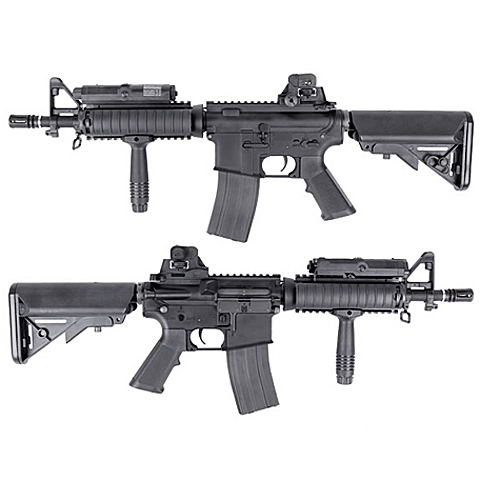 The Colt M4 CQB-R Ultra Grade rifle is equipped with Nylon Fiber receiver to reduce the rifle weight and high grade Aluminum tactical rail to install accessories. The gearbox is made from high quality internal parts to ensure the shooting power and durability. 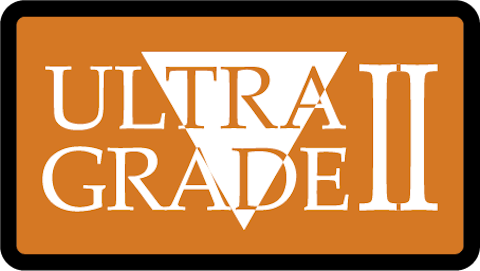 This rifle is an official licensed product with full trademarks and logo. Package comes with 2 rail covers, a fore grip, a sling swivel, a battery case and a 300 rounds magazine. The Colt M933 Ultra Grade rifle is equipped with Nylon Fiber receiver to reduce the rifle weight. The gearbox is made from high quality internal parts to ensure the shooting power and durability. This rifle is an official licensed product with full trademarks and logo. Package comes with a 300 rounds magazine. This lightweight AEG equipped with durable nylon fiber 4 inch railed handguard and collapsible crane stock. It is a 7 inch outer barrel tanker rifle which comes with "TAC Grip" pistol grip and 600M folding rear sight. A high performance 7mm bushing gearbox is used for this rifle. Package comes with 300 rounds high capacity magazine. The quick spring change system Ver.2 gearbox helps to replace the spring and adjust the shooting power easily. 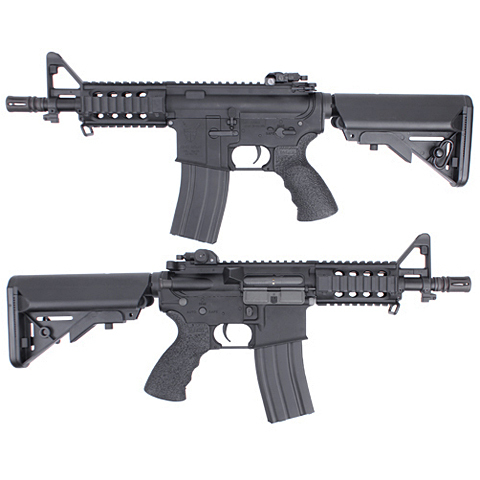 This lightweight AEG equipped with durable nylon fiber handguard with realistic heat shield placed inside and fixed buttstock. It is a 20 inch outer barrel assault rifle which comes with 600M folding rear sight. A high performance 7mm bushing gearbox is used for this rifle. Package comes with 300 rounds high capacity magazine. This lightweight AEG equipped with durable nylon fiber Rail Interface System (R.I.S) handguard and collapsible crane stock. 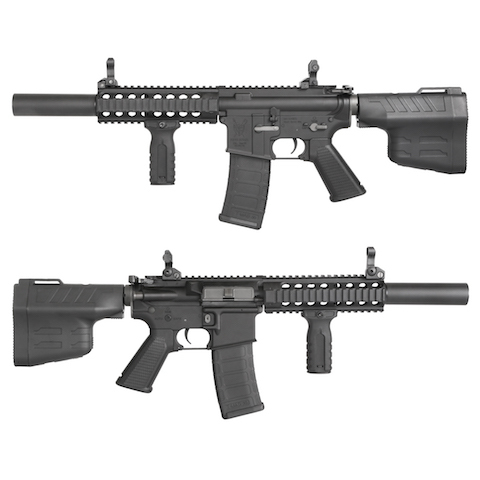 It is a 10.5 inch outer barrel CQB rifle which comes with carry handle and adjustable rear sight. A high performance 7mm bushing gearbox is used for this rifle. Package comes with 2 pieces 300 rounds high capacity magazine, charger, 9.6V crane stock type battery and vertical tac grip. This lightweight AEG equipped with durable nylon fiber Rail Interface System (R.I.S) handguard and collapsible crane stock. 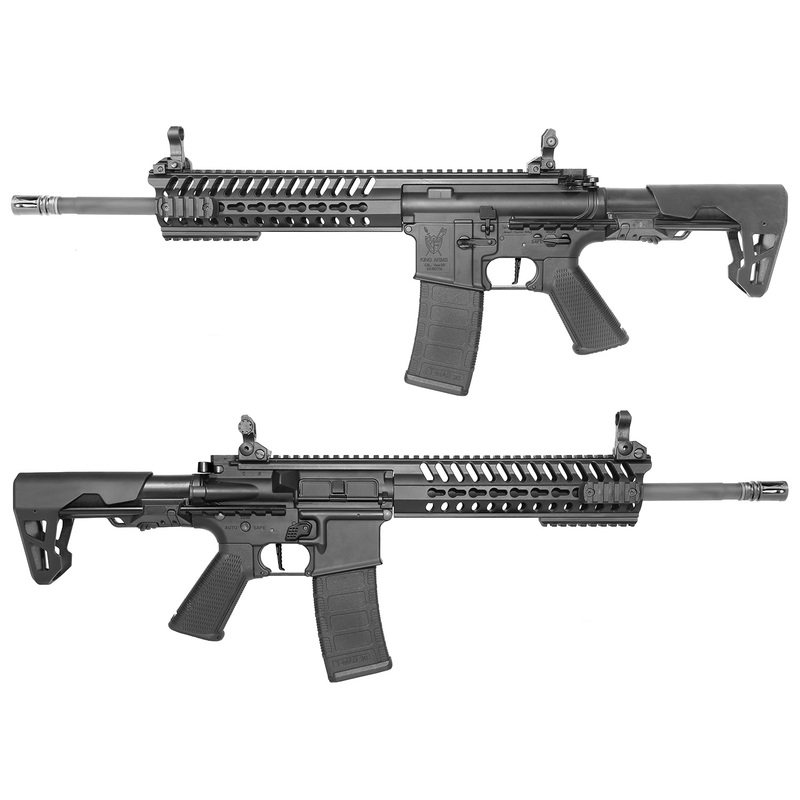 It is a 10.5 inch outer barrel CQB rifle which comes with carry handle and adjustable rear sight. A high performance 7mm bushing gearbox is used for this rifle. Package comes with 300 rounds high capacity magazine and vertical tac grip. The quick spring change system Ver.2 gearbox helps to replace the spring and adjust the shooting power easily. 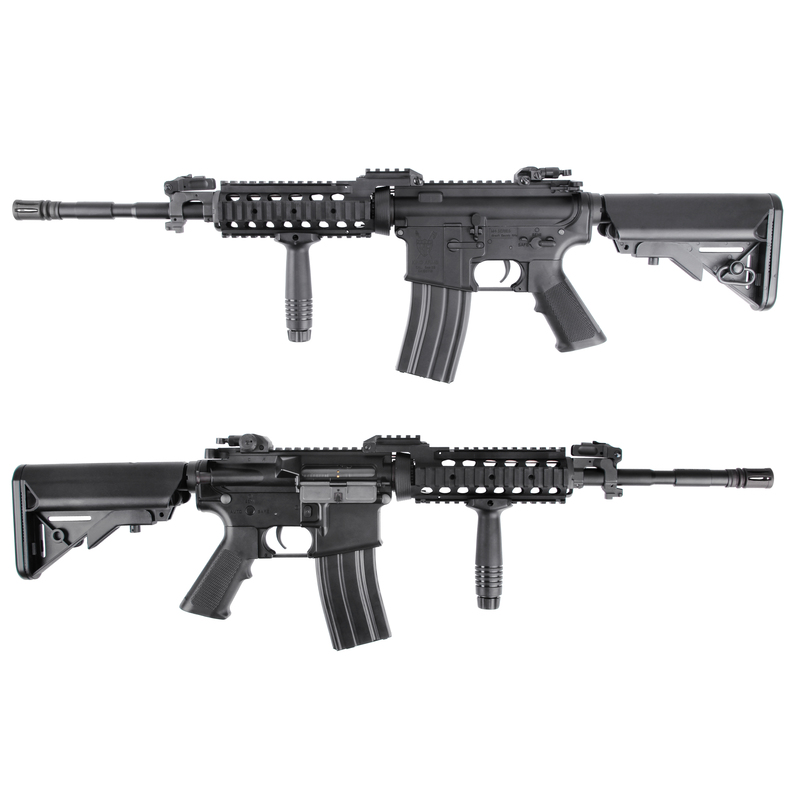 This lightweight AEG equipped with durable nylon fiber handguard and collapsible buttstock. 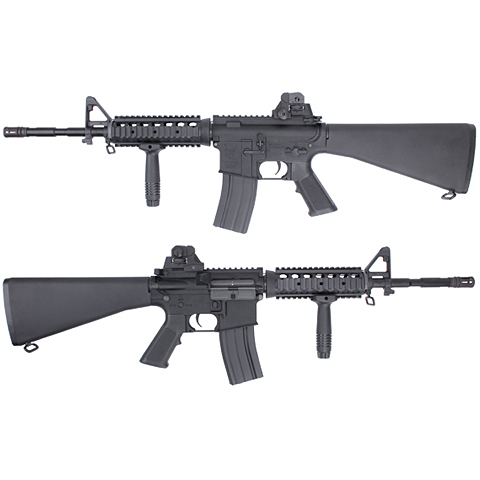 It is a standard 14.5 inch outer barrel carbine rifle which comes with carry handle and adjustable rear sight. The quick spring change system Ver.2 gearbox helps to replace the spring and adjust the shooting power easily. 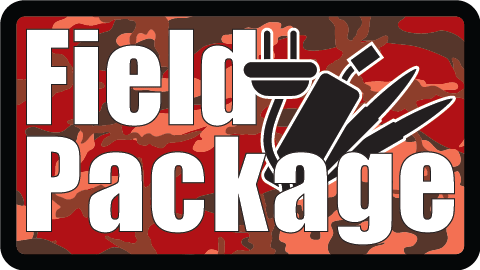 Package comes with 2 pieces 300 rounds high capacity magazine, charger and 9.6V crane stock type battery. 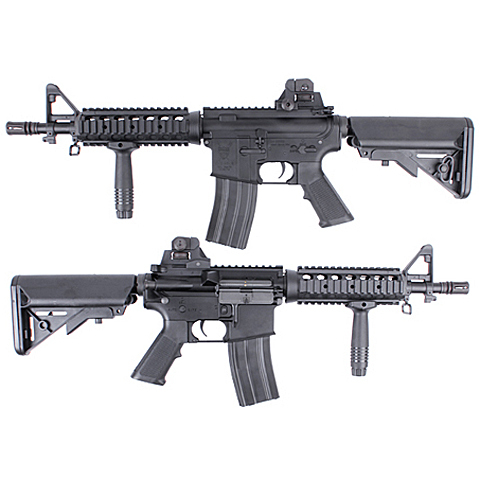 This lightweight AEG equipped durable nylon fiber Rail Interface System (R.I.S) handguard and fixed buttstock. 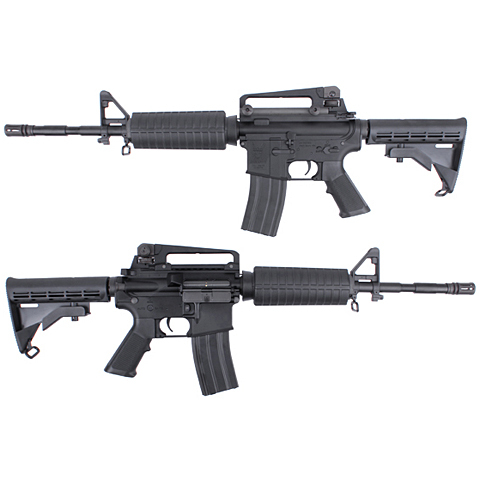 It is a standard 14.5 inch outer barrel carbine rifle which comes with adjustable rear sight. A high performance 7mm bushing gearbox is used for this rifle. Package comes with 300 rounds high capacity magazine and vertical tac grip. This lightweight AEG equipped durable nylon fiber Rail Interface System (R.I.S) handguard and collapsible buttstock. 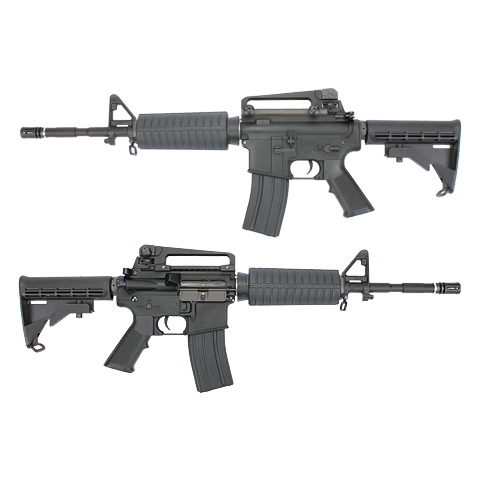 It is a standard 14.5 inch outer barrel carbine rifle which comes with adjustable rear sight. A high performance 7mm bushing gearbox is used for this rifle. Package comes with 2 pieces 300 rounds high capacity magazine, charger, 9.6V crane stock type battery, battery case and vertical tac grip. This lightweight AEG equipped durable nylon fiber Rail Interface System (R.I.S) handguard and collapsible buttstock. 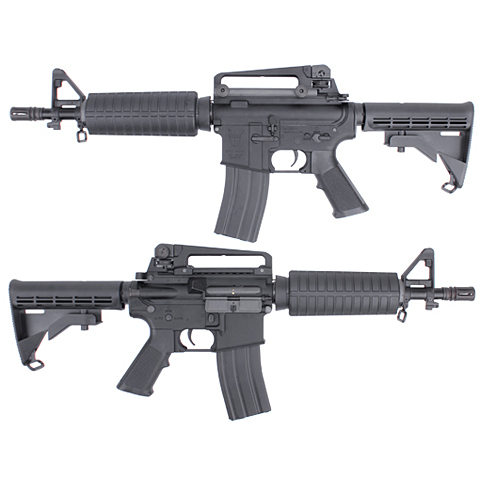 It is a standard 14.5 inch outer barrel carbine rifle which comes with adjustable rear sight. A high performance 7mm bushing gearbox is used for this rifle. Package comes with 300 rounds high capacity magazine, battery case and vertical tac grip. 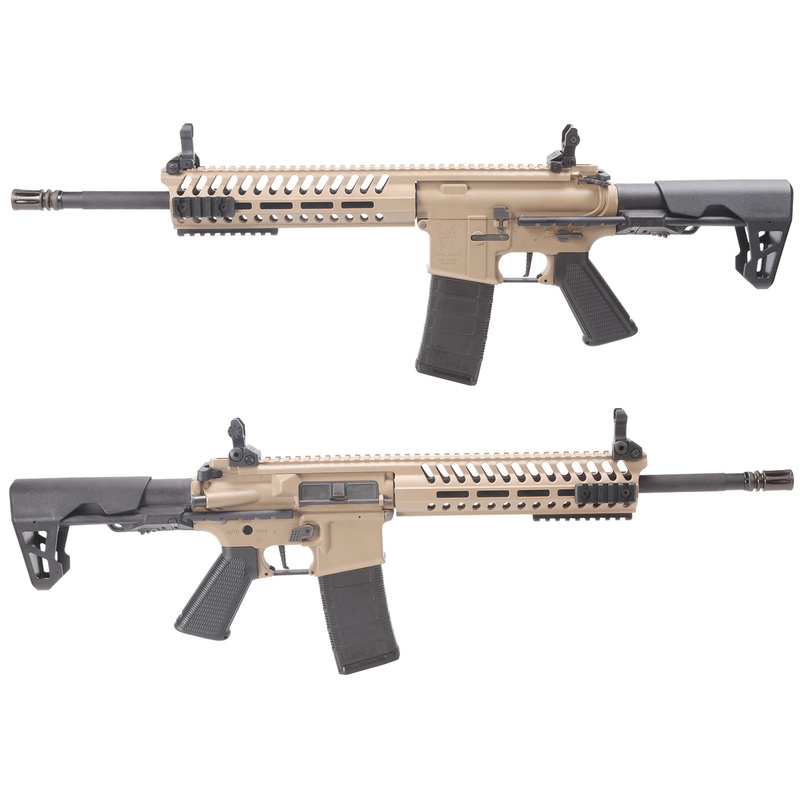 This lightweight AEG equipped with durable nylon fiber handguard and collapsible buttstock. 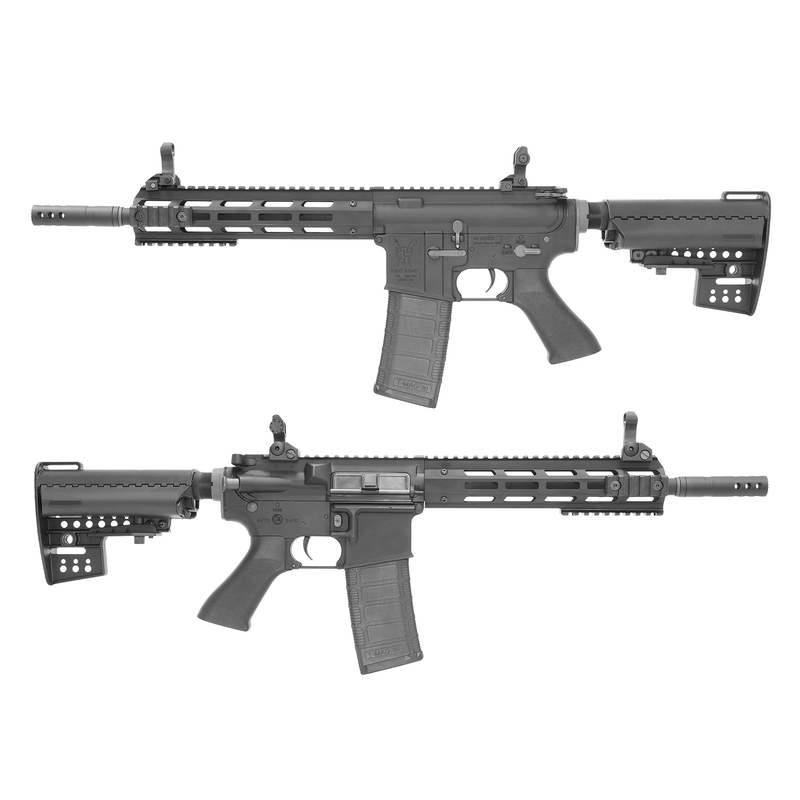 It is a 10.5 inch outer barrel CQB rifle which comes with carry handle and adjustable rear sight. A high performance 7mm bushing gearbox is used for this rifle. Package comes with 300 rounds high capacity magazine. 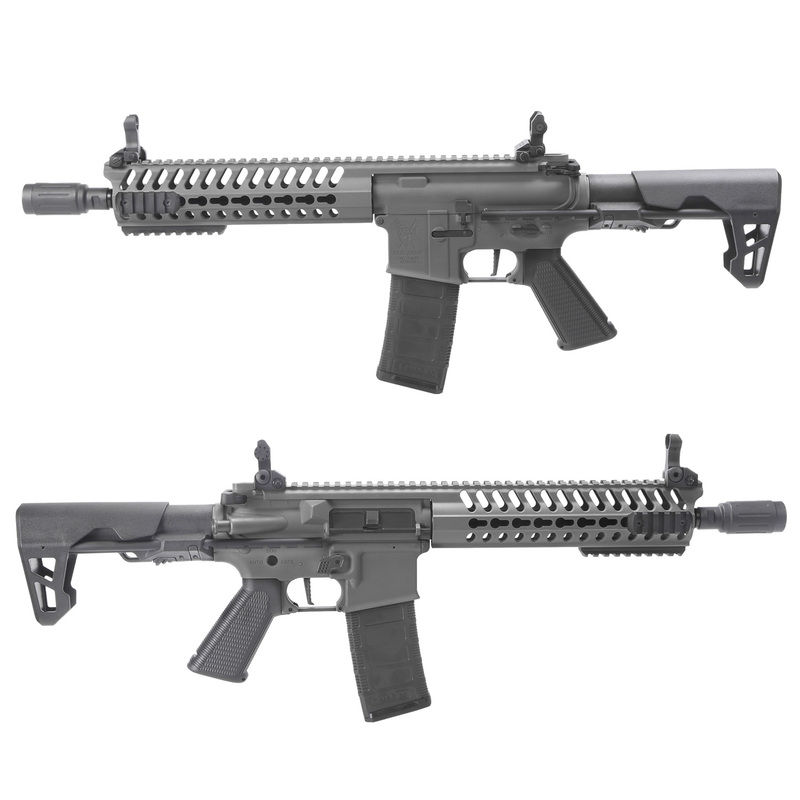 This lightweight AEG equipped with durable nylon fiber handguard and collapsible buttstock. 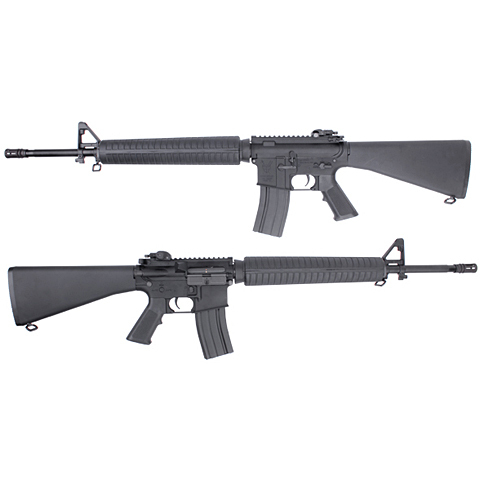 It is a standard 14.5 inch outer barrel carbine rifle which comes with carry handle and adjustable rear sight. The quick spring change system Ver.2 gearbox helps to replace the spring and adjust the shooting power easily. Package comes with 300 rounds high capacity magazine. This lightweight AEG equipped with durable nylon fiber Rail Rail Adapter System II (R.A.S II) handguard and collapsible crane stock. It is a standard 14.5 inch outer barrel carbine rifle which comes with KAC style folding front sight and 600M folding rear sight. A high performance 7mm bushing gearbox is used for this rifle. Package comes with 300 rounds high capacity magazine and vertical tac grip. This lightweight AEG equipped with durable nylon fiber Rail Adapter System II (R.A.S II) handguard and collapsible crane stock. It is a standard 14.5 inch outer barrel carbine rifle which comes with KAC style folding front sight and 600M folding rear sight. A high performance 7mm bushing gearbox is used for this rifle. Package comes with 2 pieces 300 rounds high capacity magazine, charger, 9.6V crane stock type battery and vertical tac grip. This lightweight AEG equipped with durable nylon fiber Rail Interface System (R.I.S) handguard and collapsible crane stock. 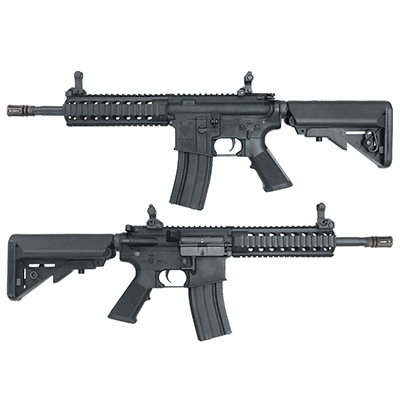 It is a standard 14.5 inch outer barrel CQB rifle which comes with adjustable rear sight. The quick spring change system Ver.2 gearbox helps to replace the spring and adjust the shooting power easily. Package comes with 300 rounds high capacity magazine and vertical tac grip. This lightweight AEG equipped with durable nylon fiber Training Weapon System (TWS) Rail handguard and collapsible crane stock. 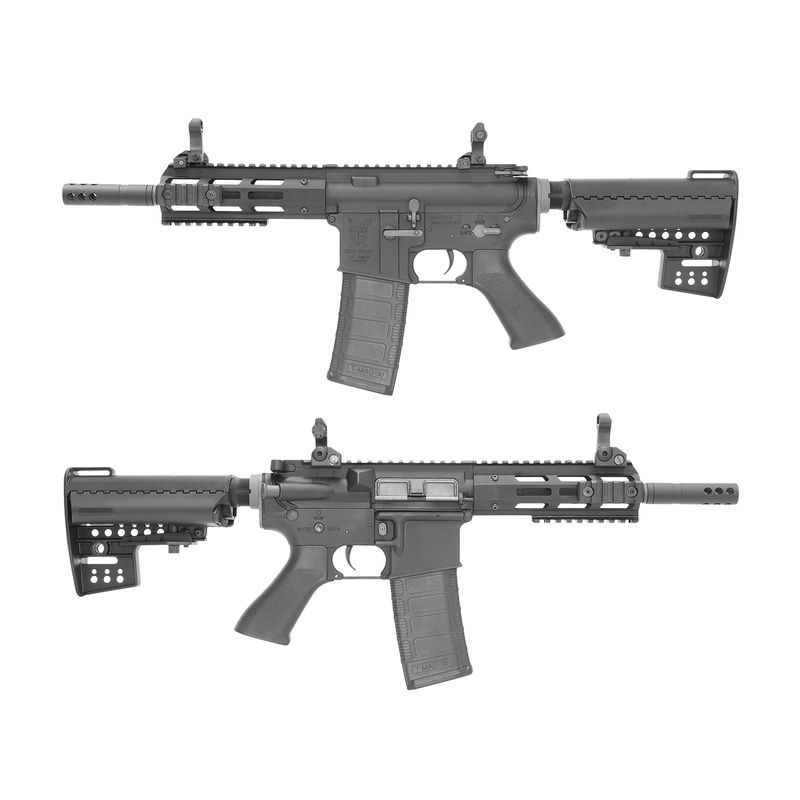 It is a standard 14.5 inch outer barrel CQB rifle which comes with Flip-Up front & rear sight. The quick spring change system Ver.2 gearbox helps to replace the spring and adjust the shooting power easily. Package comes with 300 rounds high capacity magazine and vertical tac grip. This lightweight AEG equipped with durable nylon fiber Training Weapon System (TWS) Rail handguard and TWS STOCK TYPE 2. 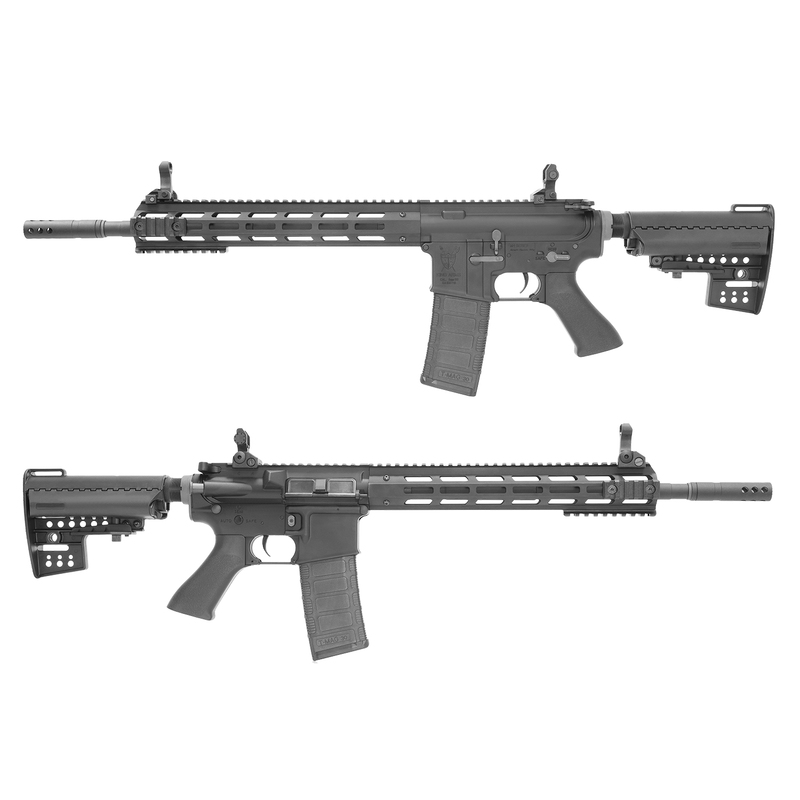 It is a 10.5 inch outer barrel Carbine rifle which comes with Nylon Troy Front Sight and Rear Sight. A high performance Quick spring change Ver.2 gearbox with 7mm bearing is used for this rifle. 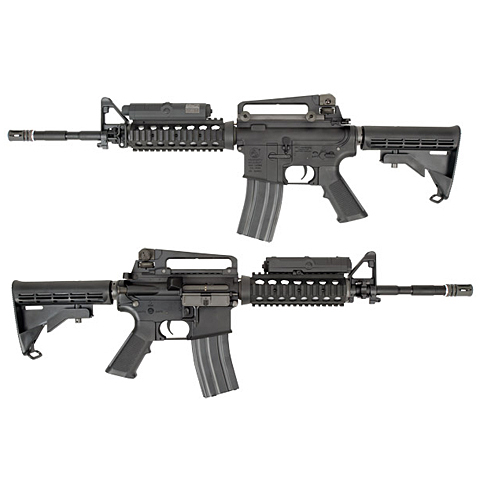 Package comes with 370 rounds high capacity magazine and Training Weapon System (TWS) Front Grip. The quick spring change system Ver.2 gearbox helps to replace the spring and adjust the shooting power easily and Mosfet assembly provides better trigger contact. 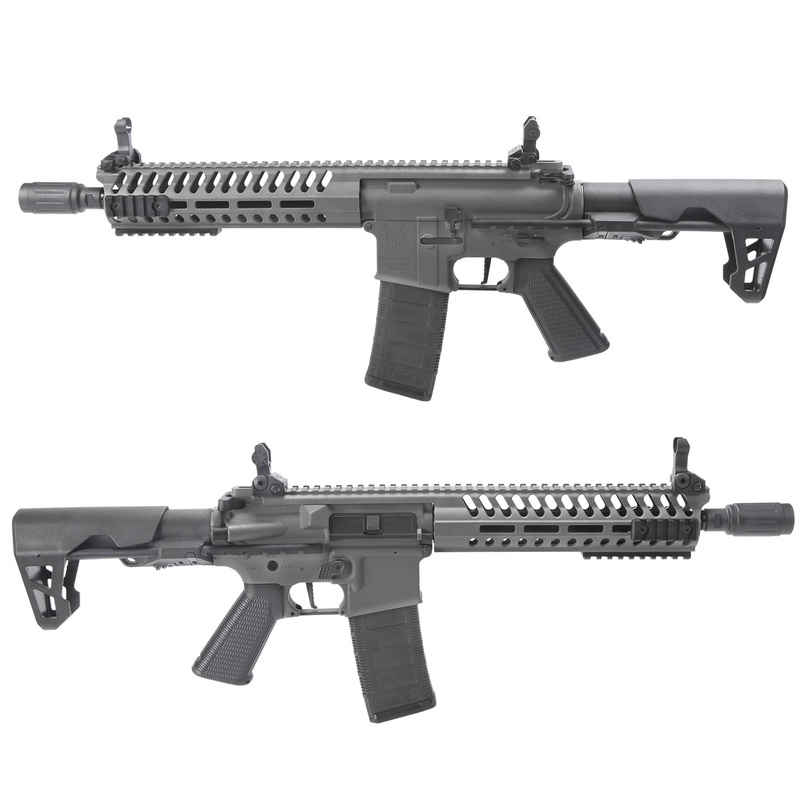 This lightweight AEG equipped with durable nylon fiber Training Weapon System (TWS) Rail handguard and TWS STOCK TYPE 2. 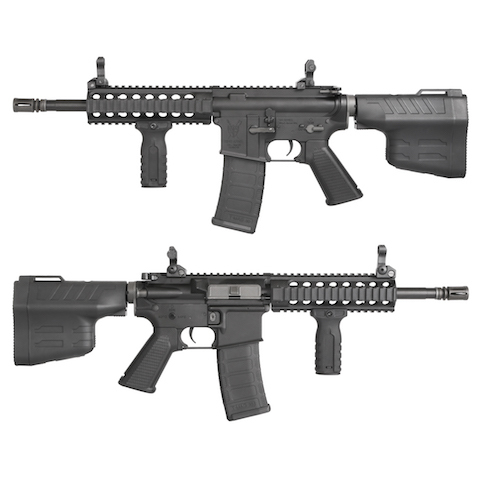 It is a 4 inch outer barrel Carbine rifle which comes with Nylon Troy Front Sight and Rear Sight. A high performance Quick spring change Ver.2 gearbox with 7mm bearing is used for this rifle. 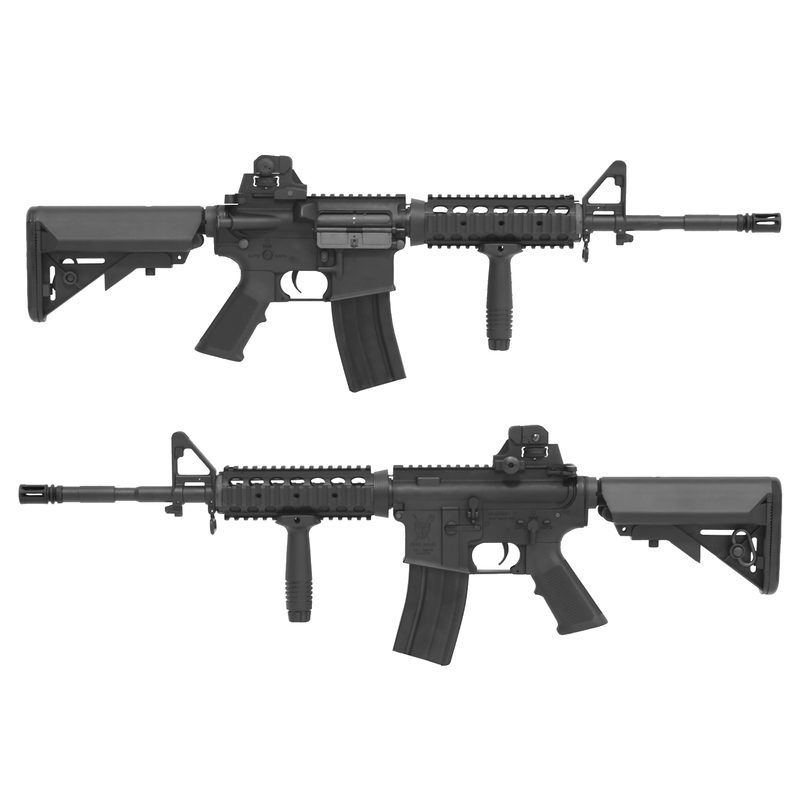 Package comes with 370 rounds high capacity magazine and Training Weapon System (TWS) Front Grip. The quick spring change system Ver.2 gearbox helps to replace the spring and adjust the shooting power easily and Mosfet assembly provides better trigger contact. 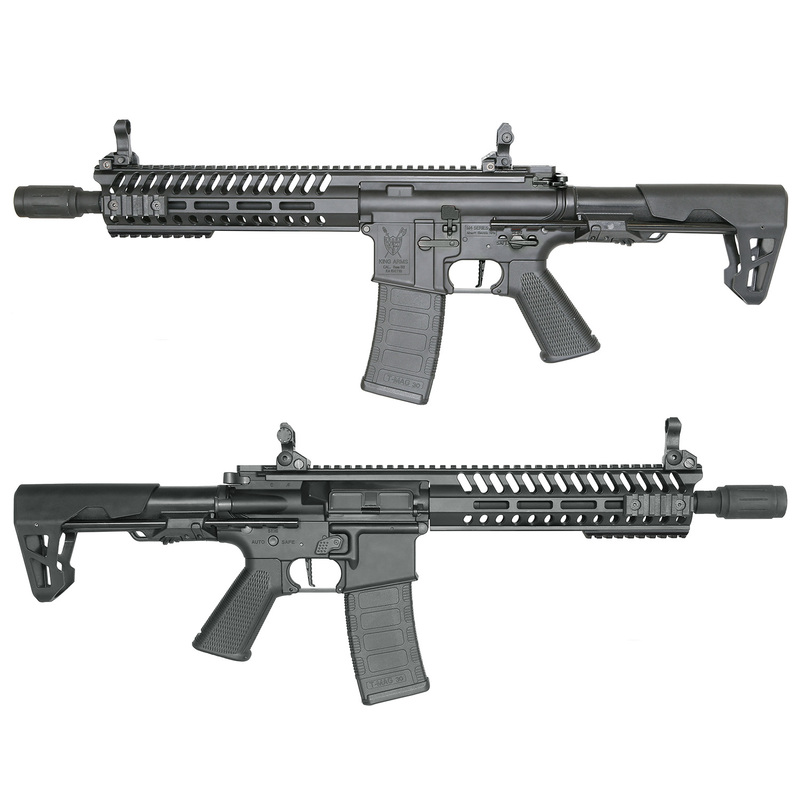 1.M-LOK tactical handguard： - M-LOK is the most trendy rail system in the real firearms. 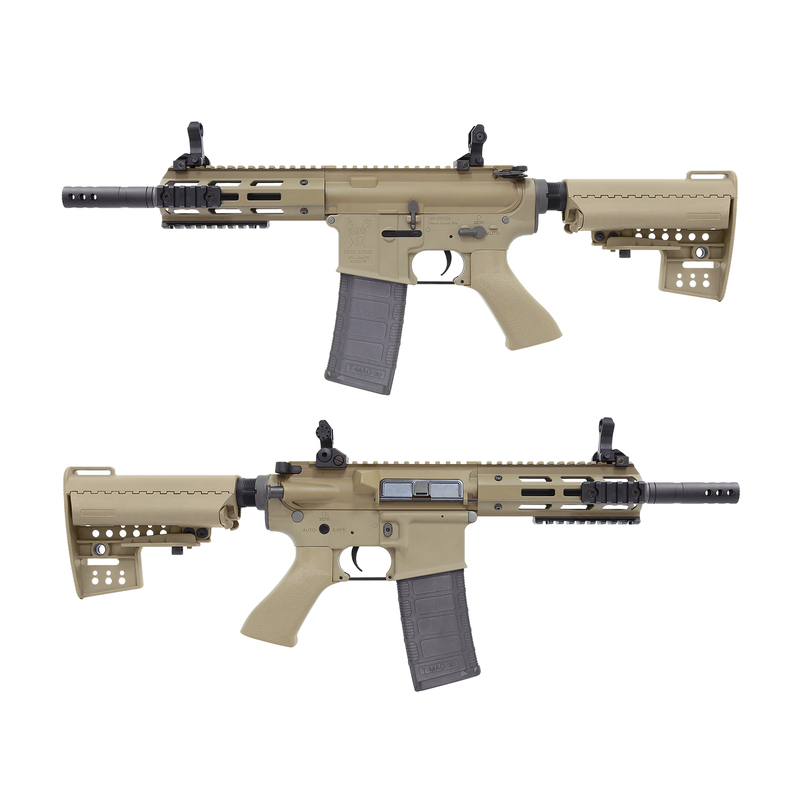 KING ARMS got MAGPUL official approval to use their design. 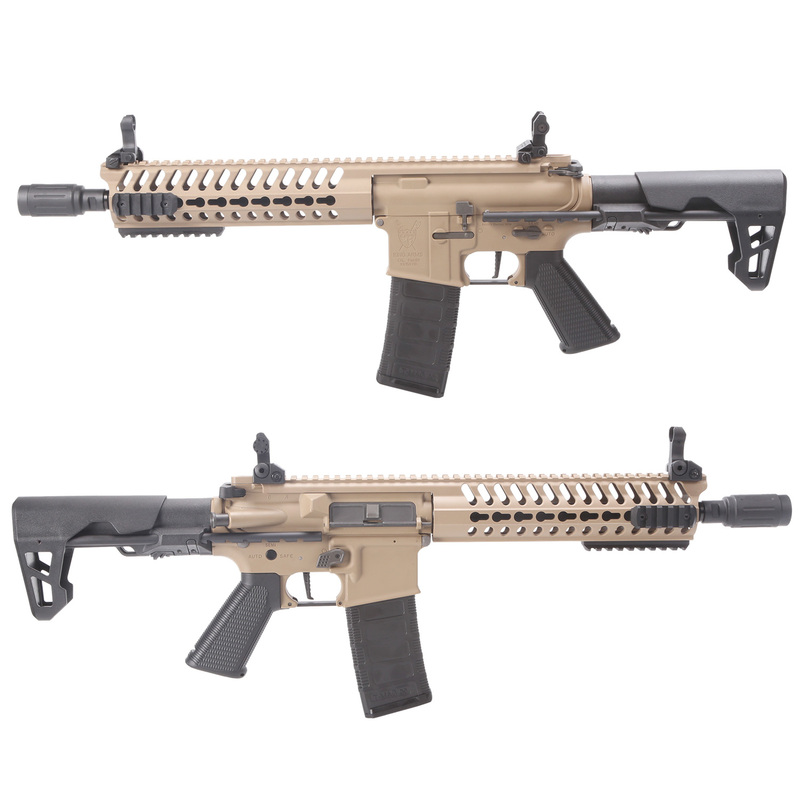 the M-LOK specification done according to MAGPUL provided document. 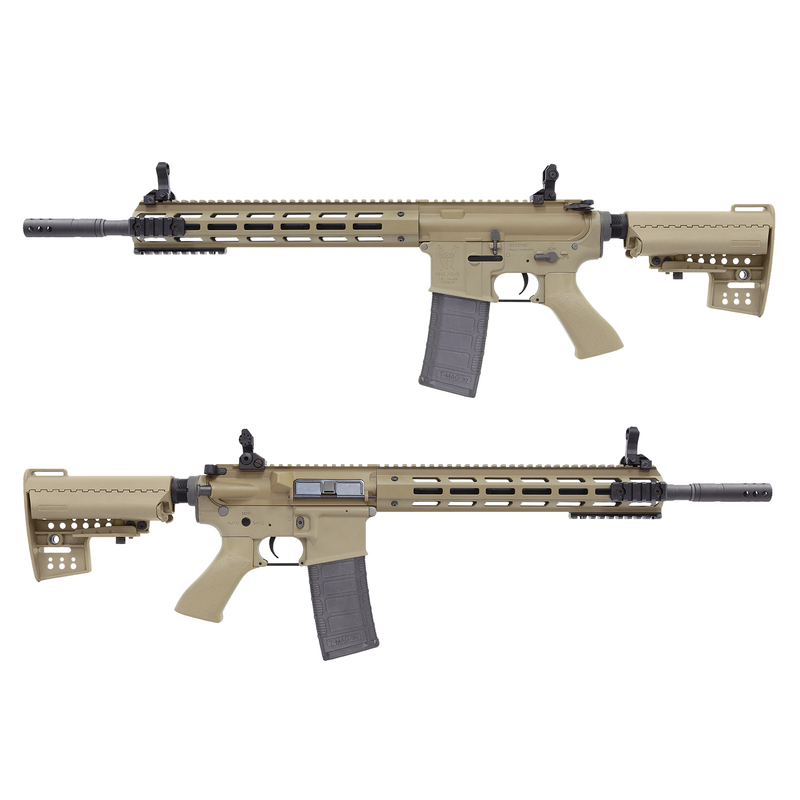 - One piece CNC machined metal M-LOK handguard provides a solid rail platform. 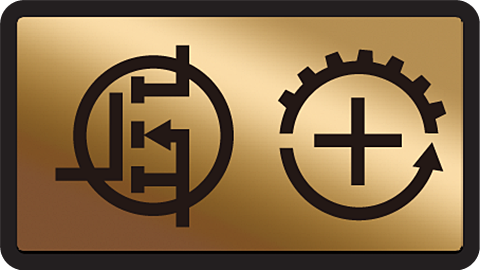 M-LOK-standard accessories can be bolt-on quickly and concretely. - Four-sided mounting platform conveniences shooters to bolt-on vary accessories. - Come with 3 pieces of picatinny rail sections. 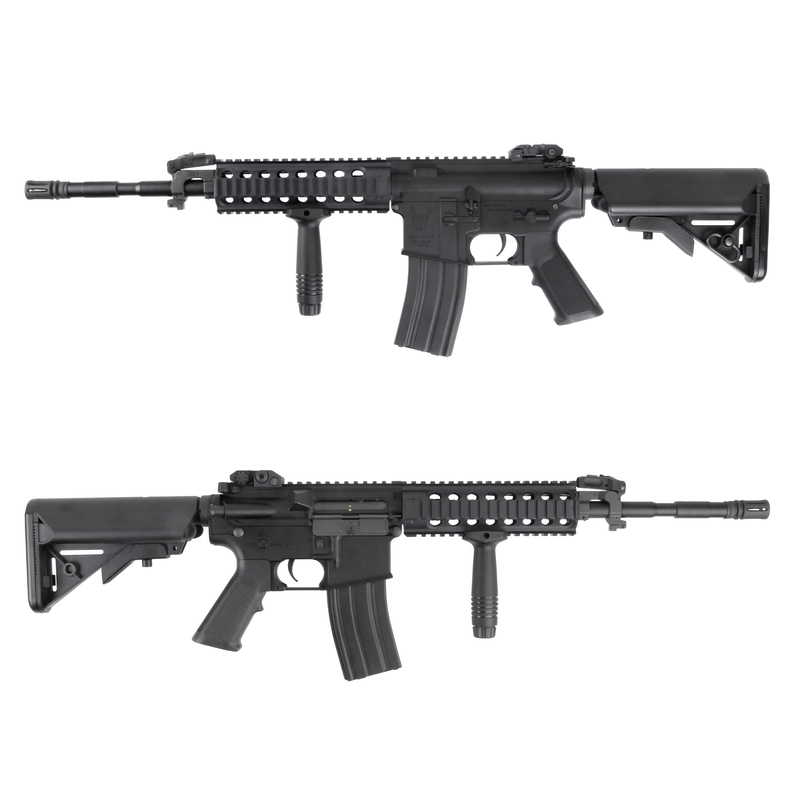 2.Tactical stock： - M4 enhanced carbine Modstock is the same size as a real stock and it has a special compartment for storing accessories or 2x cr123a battery. - Two quick detachable sling swivel mounting points provides convenience platform to suit shooter's rifle carrying habits. - Six adjustable positions to suit shooter's arm-length. - Wide cheek weld helps shooter aims more quickly and the cheek rest more comfortable. 3.Suppressor： - Stylish extended fire cap design make the rifle looks cool and outstanding. - 14mm anti-clockwise thread for easily to replace with other accessories,such as silencer or tracer. 4.Non-slip grip： - Rough surface design can prevent slip of griping. You can grasp full control of your rifle confidently. 5.Sights： - Nylon fiber polymer front sight and rear sight are rigid but light in weight. Both of them are rail mounting and able to flip-up. They have adjustable aiming pins and range finder hole to fit corresponding difference field-shooting environment. 6.Magazine： - TWS mid- cap magazine stores up to 140rounds 6mm bullets. - Non-slip texture polymer casing ensures the operator access the magazine confidently. 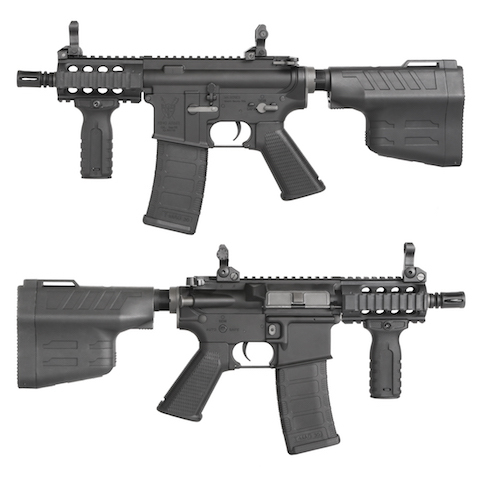 7.Rifle body： - Durable nylon fiber Training Weapon System (TWS) integrated receiver. It keeps the structure of the rifle rigid but lighter in weight. - Tight fit upper and lower frame. 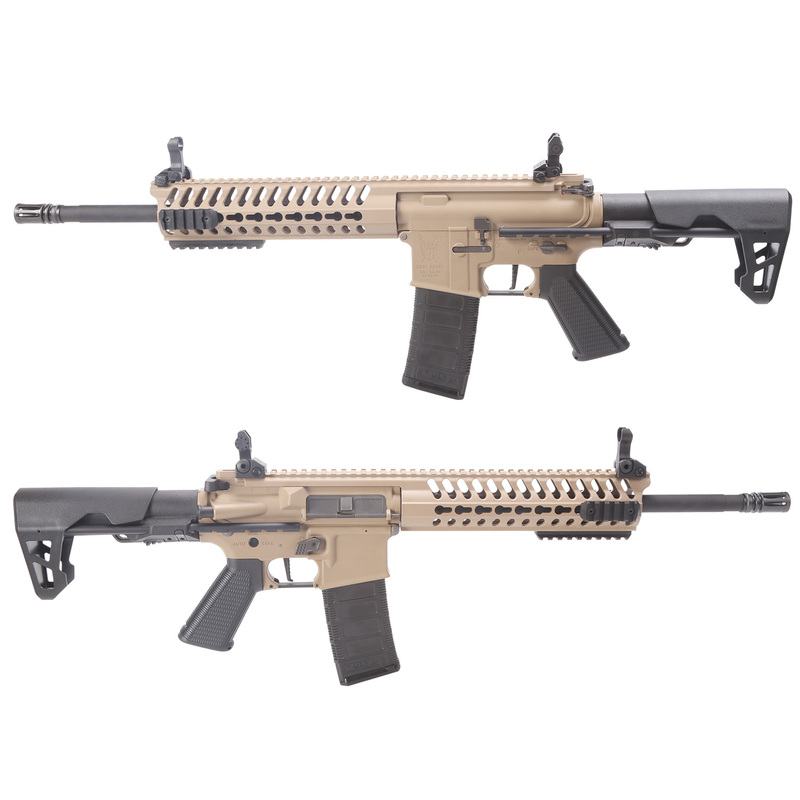 - Vary markings, such as KING ARMS logo on the rifle body. - Metal bolt catch, selector lever, trigger make the gun more durable. 8.Outer & Inner Barrel： - Metal outer barrel and delta ring mount to avoid wobbling. - Well-polished precise 6.05mm brass inner barrel lets every shot more accurate. 9.Gearbox： - Highly calibrated 7mm bearing gearbox with metal spring guide. - Quick change spring system can let operator alter the power spring easier. 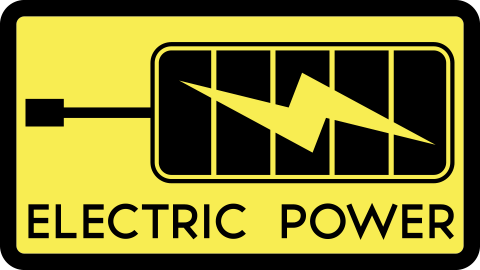 - The power circle comes with a reliable MOSFET gives accuracy triggering. - Adjustable metal hop-up unit. 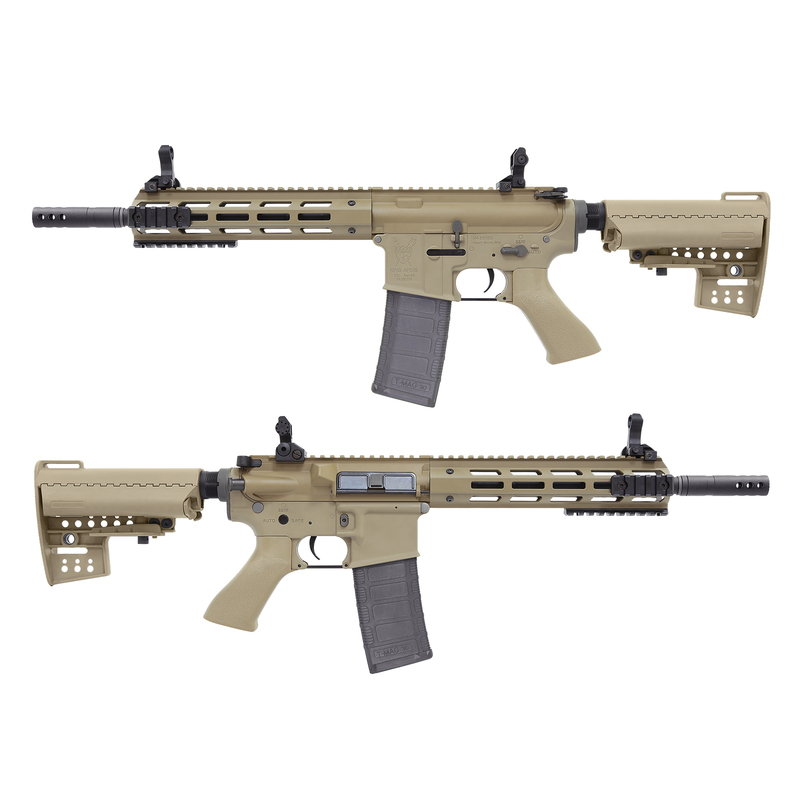 1.Tactical handguard - King Arms M4 striker series is constructed by high quality nylon fiber , this lightweight AEG equipped with durable nylon fiber trendy Keymod & M-lok rail. -One piece design including the upper rail let the shooting more accurate. -Four-sided mounting platform conveniences shooters to bolt-on vary accessories. - Come with 3 pieces of picatinny rail sections. 2.Barrel - Metal made outer metal to avoid wobbling. It also protect the well-polished brass 6.05mm inner barrel for a precise shooting. - Rifle come with a new designed suppressor. 3.Receiver - Receiver was built by high grade Nylon polymer, providing a lighter in overall weight without compromising of longer resistance and durability. - Stylish design of the receiver with chopped-off dust cover, together with good-looking fire-mode-selector, bolt release button, gives an eye catching outlook of the rifle. - Vertical design trigger improve the flexibility of shooting and non-slip design increase the friction of smooth surface. 4.Gearbox - Highly calibrated 7mm bearing metal gearbox with metal spring guide. - Equipped with a Mosfet triggering circuit that provides maximum accuracy. - With feature of Quick Spring Change System, let shooter alter power spring easily. - Hop up unit allows shooter to adjust the range of the shooting and the precision. 5.Non-slip grip： - Rough surface design can prevent slip of griping. You can grasp full control of your rifle confidently. 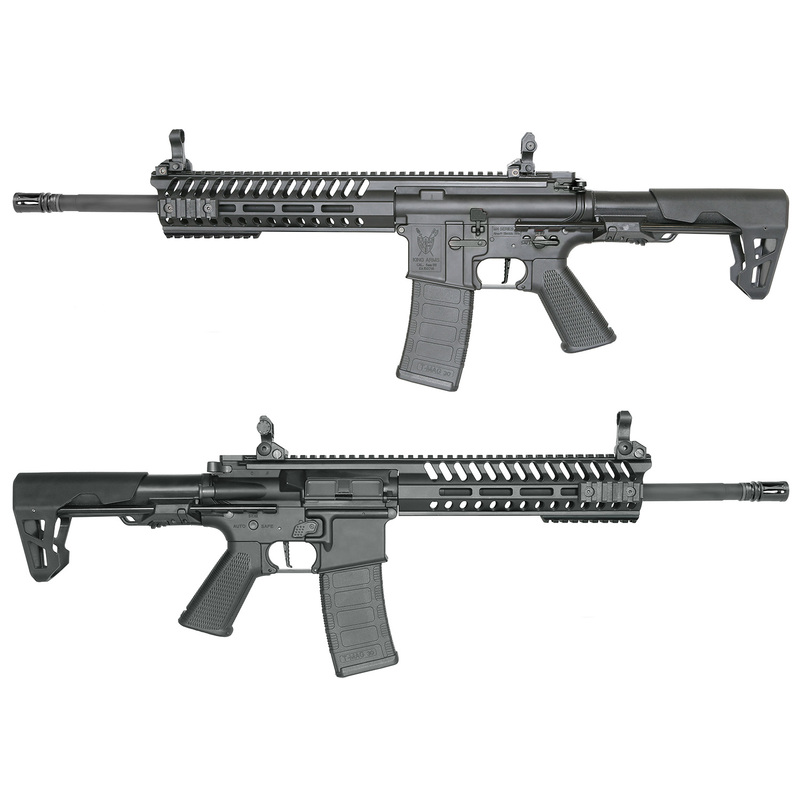 6.Tactical stock - 7 position quick pull and auto-locking system provides the fastest adjustment possible. - Enlarged stock tube with a compartment for batteries up to 1400mah-12v. The compartment is easily accessible by operating the rear gunstock cap. 7.Sights - Foldable rear and front sights. - Rear sight comes with a double viewfinder for high precision shooting. 8. Magazine - TWS mid- cap magazine stores up to 140rounds 6mm bullets. - Non-slip texture polymer casing ensures the operator access the magazine confidently. 1.Tactical handguard - King Arms M4 striker series is constructed by high quality nylon fiber , this lightweight AEG equipped with durable nylon fiber trendy Keymod & M-lok rail. - One piece design including the upper rail let the shooting more accurate. - Four-sided mounting platform conveniences shooters to bolt-on vary accessories. - Come with 3 pieces of picatinny rail sections. 2.Barrel - Metal made outer metal to avoid wobbling. It also protect the well-polished brass 6.05mm inner barrel for a precise shooting. - Rifle come with a new designed suppressor. 3.Receiver - Receiver was built by high grade Nylon polymer, providing a lighter in overall weight without compromising of longer resistance and durability. - Stylish design of the receiver with chopped-off dust cover, together with good-looking fire-mode-selector, bolt release button, gives an eye catching outlook of the rifle. - Vertical design trigger improve the flexibility of shooting and non-slip design increase the friction of smooth surface. 4.Gearbox - Highly calibrated 7mm bearing metal gearbox with metal spring guide. - Equipped with a Mosfet triggering circuit that provides maximum accuracy. - With feature of Quick Spring Change System, let shooter alter power spring easily. - Hop up unit allows shooter to adjust the range of the shooting and the precision. 5.Non-slip grip： - Rough surface design can prevent slip of griping. You can grasp full control of your rifle confidently. 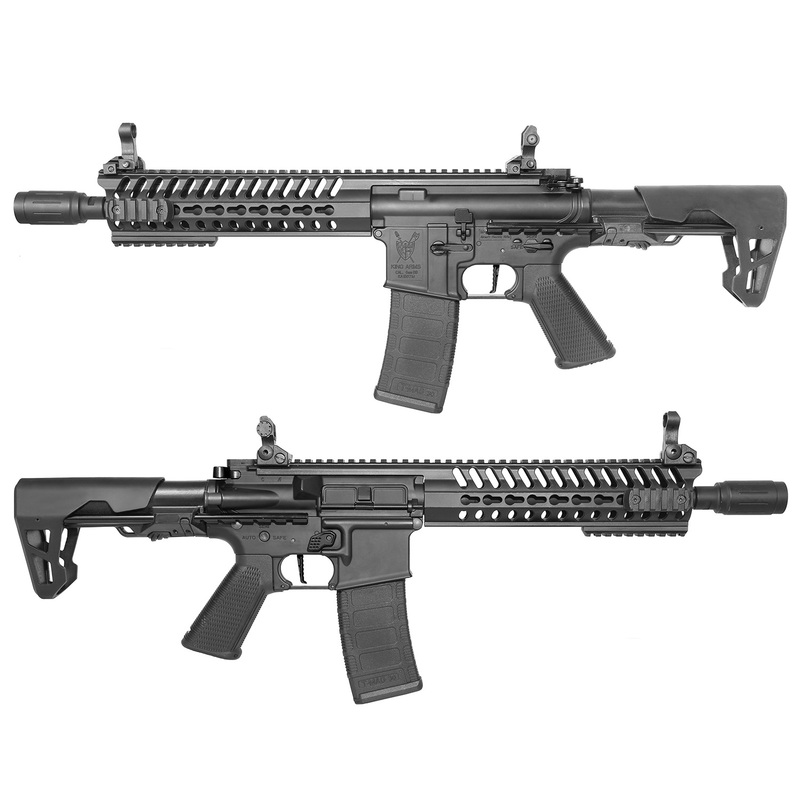 6.Tactical stock - 7 position quick pull and auto-locking system provides the fastest adjustment possible. - Enlarged stock tube with a compartment for batteries up to 1400mah-12v. The compartment is easily accessible by operating the rear gunstock cap. 7.Sights - Foldable rear and front sights. - Rear sight comes with a double viewfinder for high precision shooting. 8. Magazine - TWS mid- cap magazine stores up to 140rounds 6mm bullets. - Non-slip texture polymer casing ensures the operator access the magazine confidently.